What comes to mind when you think of pizza? Do you think of thinly sliced pepperoni on your pizza with just the right crunch after spending time in the oven? Do you think of hot cheese stretching from the slice to your mouth because it’s so ooey gooey? While it’s nice to have some traditional toppings on your pizza, sometimes it can be more beneficial to go a more exotic route and get out of your usual routine. Anytime you go for pizza, you probably get the exact some pie, right? You probably have your preference, especially if you do it on the same day of the week. At Kelsey’s Pizza, we have a wide variety of pizza choices. You can decide on a pizza that has steak and cheese or you can go with a Milano pizza. If you don’t find a pizza that you want to eat, then you can always create your own. Homemade and delicious, you won’t go wrong when you decide on Kelsey’s Pizza. Instead of going for a pie that’s exactly the same as you usually consume, try some toppings that are a little different. At Kelsey’s Pizza, we strive to have pizzas that are a little less than ordinary, but taste extraordinary. Below are just some of the toppings that you can find on the pizzas that we have at our pizza restaurant. If you have any questions about the toppings that we offer, then make sure to ask your waiter or waitress when you come in to enjoy a pie. Broccoli: Whoever thought of putting this vegetable on a pizza? Vegetables are one of those food groups that can go on any type of pizza and still taste delicious. This Milano inspired pizza will be just what you need to get your broccoli intake as well as step outside the pizza box. Pineapple: This topping has been up for debate on whether it really belongs on a pizza. We believe it does because a Hawaiian pizza is nothing without pineapple. If you want a bite of something sweet, then you’ll enjoy this option. Sliced Steak: On our steak and cheese pizza we have thinly sliced steak. Thinly sliced steak is just as good as pepperoni for those who don’t want to deviate too much from what they usually get and it allows you to get out of your usual routine. Zucchini: Like broccoli, zucchini is great on anything. On our vegetarian pizza, we have zucchini, which will ensure that you feel healthy without having to eat a salad. Feta: Feta goes great on anything because it’s a cheese that really brings out a dish. If you want to get away from your usual cheese choice, then feta will bring a pop of flavor. Kelsey’s Pizza started over 30 years ago because Nick was dedicated to serving the people of Titusville delicious Italian food. This locally owned and operated restaurant has been catering to families and friends for decades and we’re proud to continue to do so. Whether you’re in the mood for pizza, especially after diving into some toppings that are less than ordinary or you want to indulge in a tasty meal from our grill, our menu has everything that you could expect from an authentic Italian restaurant. 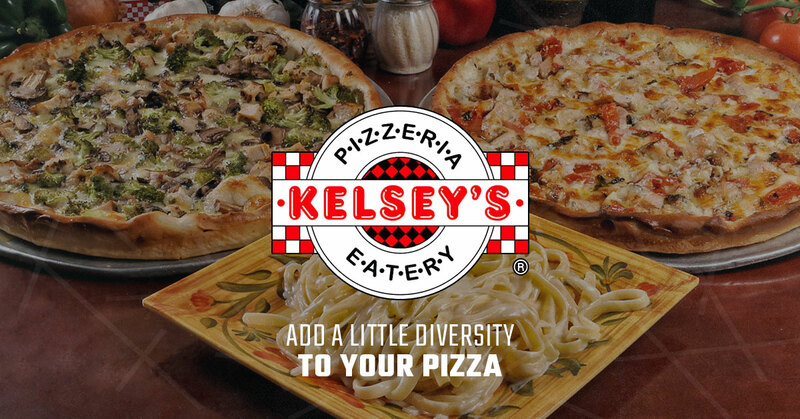 Stop by Kelsey’s Pizza to enjoy a slice of pizza with exotic toppings or to stick to your usual traditional pie.